Today we’re delighted to welcome Jo Cox-Brown to the Off Campus Blog. Jo is the Chief Executive of the Malt Cross Trust, and she’s here to tell you about her work with the Street Pastors and Safe Space. Hi my name is Jo Cox-Brown and excitingly I’ve been invited to write this guest blog. It’s a great opportunity to be able to share a little bit about what I do and why I love Nottingham so much! I grew up in Nottingham and after a 10-year break (uni, travelling and six years working in London) I returned seven years ago with a mission. I’d seen some of the bad press Nottingham got for binge drinking and crime and I thought ‘that is not the city I know and love’ and I came back wanting to make a difference. The Nottingham that I know and love is filled with fun, great talent, diverse and well-run businesses, beautiful parks, friendly locals and opportunities for all types of people. Today I’m the Chief Executive of the Malt Cross Trust, a Christian Charity on St James’s Street in Nottingham. Behind the beautiful café bar in an old Victorian Music Hall is a thriving charity that has helped over 7,000 young people in the last year. All the profit made by the café bar gets put back into charitable work that directly affects the city. Our focus is the 18 to 30 year olds – from working alongside and promoting talented young artists and musicians and helping them to reach their potential, to doing outreach work such as Street Pastors and offering a Safe Space in the city, to helping people engage with Victorian history and heritage. Today we still have lots of student volunteers involved in the project from a variety of faculties. I’ve been asked to share a little bit about the work of Street Pastors and Safe Space, which I started three years ago. 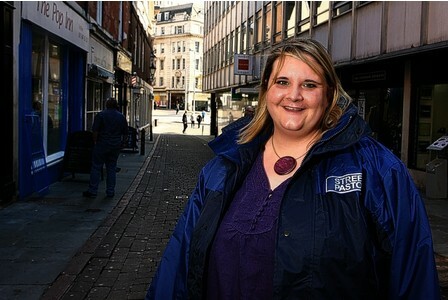 You may have seen the Street Pastors when you’ve been out and about in our big blue jackets! There are over 100 volunteer Street Pastors (including around 15 students) from churches all over the city, aged from 18 to an impressive 70+! The Street Pastors aim to love, care for, support and listen to anyone and everyone we meet. We are a visible presence on the streets of Nottingham, whether that’s in the city centre (on Friday and Saturday nights 10pm to 3am) or local neighborhoods around the city. We care about what happens in our city and our communities and we want to make sure that they are as safe as possible. We are ordinary people from diverse backgrounds with a concern for society and our aim is to engage people where they are, in terms of their thinking and location. We aim to build long-term relationships with people in our communities, breaking down barriers and promoting community cohesion. A typical night for Community Street Pastors could include chatting to local young people, helping someone with their shopping, performing first aid, emotionally supporting people dealing with various life, engaging local residents, working with young people in danger of entering gangs, and signposting people to appropriate services. A typical night for City Centre Street Pastors includes giving out flip flops to girls who have removed their heels, handing out bottles of water and lollipops, chatting to people and sharing information to enable a safe night out, giving young people advice on alcohol or drugs, working alongside the police to support victims of crime, giving first aid, working with someone who is homeless to help them access the right support, signposting someone who is a victim of domestic violence to the most appropriate help or helping students like yourselves to get home safely. Today, thanks to great partnership working between multiple organisations on the city, crime in Nottingham is down by over 42% and the city now has a Purple Flag Award for being a safe city in which to spend a night out. This shows how, by working together, we can make a difference to the communities in which we live. If you are interested in getting involved in any aspect of the Malt Cross Project drop me an email on jo@maltcross.com – I would love to hear from you!